South Africa was a trip of a lifetime and I'm only too happy to regale stories and share photos with anyone who is willing to listen and watch my 2400 images through an old fashioned slide show. When I look at the pictures, like the one where the elephant charged us, it brings me back to the trip of a lifetime. The adventure started in Cape Town, nestled between mountains and ocean, this is a city filled with energy. On one side is Table Mountain which offers an overview of the city after an 1100 meter cable car ride. On the other side is a coast line reminiscent of the California coast with sweeping ocean views, bikers, skaters and bikini clad bodies. This world class city is also the best place to experience the full range of South African cuisine, also known as "Rainbow Cuisine." Influenced by Dutch, French, Malaysian, Mediterranean, German, and Indian cuisines, there is a plethora of tasting opportunities. South Africans are lovers of meat and it just so happens ostrich is a favorite of mine and it's abundantly available. are a few key South African dishes well worth trying. Traveling south of Cape Town is the Cape of Good Hope where cold Atlantic water meets the warm Indian ocean. If that is not enticing enough, there is the titillating chance of experiencing a baboon sneaking into your car and making off with it. Ok, not really driving off with your car but considering the damage they will do to the interior, you really don't want it back anyway. One of my favorite parts of Cape Town was the cultural aspects we were able to experience. There was the Cape Malay (Bo Kaap) community with colorful houses and open spice shops that included the opportunity to prepare and dine on a typical lunch with a local Muslim family in their house. Robben Island was a somber experience to see Nelson Mandela's prison cell where he spent 23 hours a day. And there was the township orphanage we visited. Townships are endless miles of poverty stricken population living in one room tin shacks. But their generosity shone through as we were invited into a church service - simply emotional and moving. And while these people may not have typical wealth, they have honor in their community and their pride and zest for life shows in their bright and clean clothes. But let's remember this is a vacation, so from Cape Town to townships to wine country we traveled where we experienced the best meal of the vacation at La Petite Ferme in Franschhoeke. Braised rabbit over herbed polenta, mushroom pate, Impala medallions, caramel drizzled cheese platters and a 500 gram burger, all of it stunning. This scene from our guest cabin where we spent the afternoon frolicking on the patio that overlooked our own personal pond while watching the sun set behind the mountains adorns my desktop screen. Our visit just happened to coincide with the height of grape season in Stellenbosch; 30 picturesque miles of vineyards dotting hilly terrain. Bottles of South African wine found their way into our luggage, some were classic Cabernet's but many of our bottles cradle African Pinotage and Shiraz bounties. The South African pampering continued when three flights and 10 hours later we landed on a grass runway ... only after the herd of zebras slowly grazed out of the way. Our safari guides did their homework on us ahead of time as they served us wine in silver goblets while we marveled at the herd of elephants playing in the watering hole nearby. On safari we were served warm, comforting meals. Breakfast showed the English influence through fresh tomato slices and beans; the bacon was the best I've ever eaten. Every day we would watch the sun sent from the bush with a sundowner (a drink to watch the sent set with) in one hand and a simple pickle, onion and cheese kabob in the other. Evening meals were filled with roasted and barbecued (braai) meats under a sky so filled with stars it looked fake. The safari chef even accommodated our gluten free friend with ease. To explain the safari itself does not do it justice over being there in person; there is something about seeing nature work together that left me in complete awe. Yes we watched lions eat a cape buffalo and on some level it was disgusting and smelly, yet we couldn't look away. We listened to birds signal warnings, watched dung beetles at work and we saw a mama giraffe morn the loss of her baby. Our pictures speak volumes, but the experience is life changing. The perfect end to the trip was a helicopter fly over of Victoria Falls in Zimbabwe; a simplistically flat river filled with hippos and crocs that, unknowingly, falls 108 meters into a winding gorge. A design that could only be accomplished by the power of nature. We didn't come home with much in the way of trinkets to remember our trip - a few bottles of our favorite new wine and a mask for our wall ... but our minds and hearts are filled with an enormous amount of memories we will never forget. Though unrealistic, I want to relive this trip every day. The next best option is to taste, smell and become enveloped in the dishes we experienced. 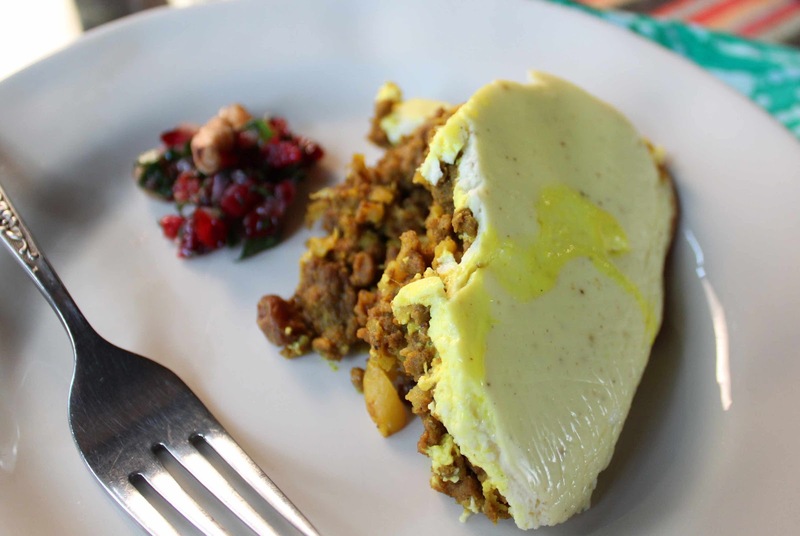 The recipe below is for an African Bobotie, a curried meat dish topped with an egg custard. As with any culture, everyone seems to have their own version of classic dishes and this is mine, but it says very true to original dishes. I've also added a little cherry chutney with mine, not something we experienced in South Africa but I thought it would be a nice addition. Your house will smell of curry for days, but think of that as bonus! Tips and techniques: My first choice in this dish is ostrich, but it's hard to come by in the States ; my second choice is to go with a mixture of ground beef and lamb. Traditional recipes call for the addition of white bread, I was making this for a gluten free friend so omitted this step. If you want to add in the bread, soak 2 slices of white bread in milk, break apart and add to the meat mixture before covering it with the egg custard. Preheat oven to 350 degrees. Heat the oil in a large saucepan, add the onions and saute until softened. Add the garlic and cook for a few minutes. Sprinkle the curry powder and ground cloves over the onions and stir. Add the meat to the curry and onions and stir until cooked, break up the meat so it's minced does not have any large hunks. Add the lemon juice, grated apple, raisins, apricot jam and slivered almonds and cook together for 15 minutes. Sprinkle the turmeric on top and stir through. Stir in the egg, salt and pepper. If you are using the soaked bread, add it now. Taste the mince and add more salt and pepper if necessary Place the cooked mince in a buttered pie dish. Tuck the bay leaves into the mince and pour the egg topping over the top (recipe below). Bake for about 15-20 minutes or until the custard sets on top. Serve with a spoon of the cherry chutney (recipe below). Enjoy! Stir the ingredients together, set aside until ready to pour over the meat mixture. Toast the walnuts in a small fry pan. Remove the walnuts and add in an drizzle of olive oil and the shallots. Cooke the shallots for just a minute or two to soften and release their flavor. Add in the apricot jam, just to warm it. 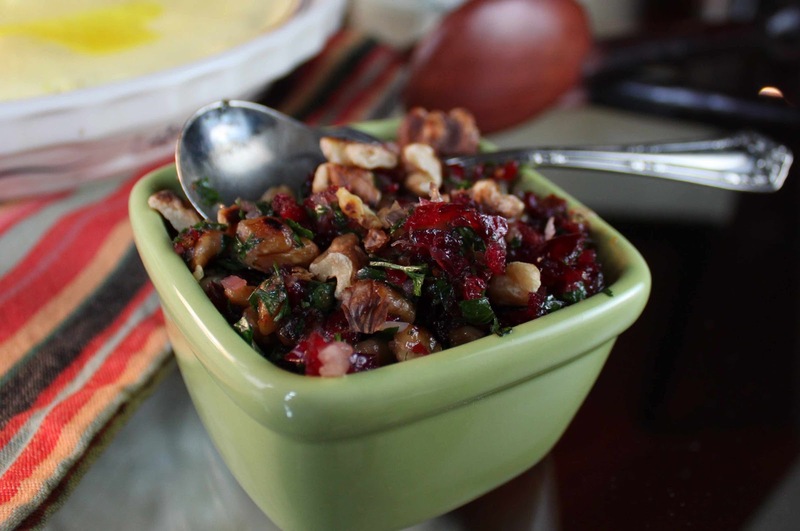 Hand crush the walnuts as you add them to the shallots, also add the chopped cherries, parsley, lemon juice and a pinch of salt and pepper. Toss and set aside until ready to use. Thanks Janine! Sounds like you have had quite and experience as well, one your children will never forget. I can't wait to get see more of this amazing planet. Where are you going next?